Yesterday we received the map necklace Gene bought for me a few months ago. 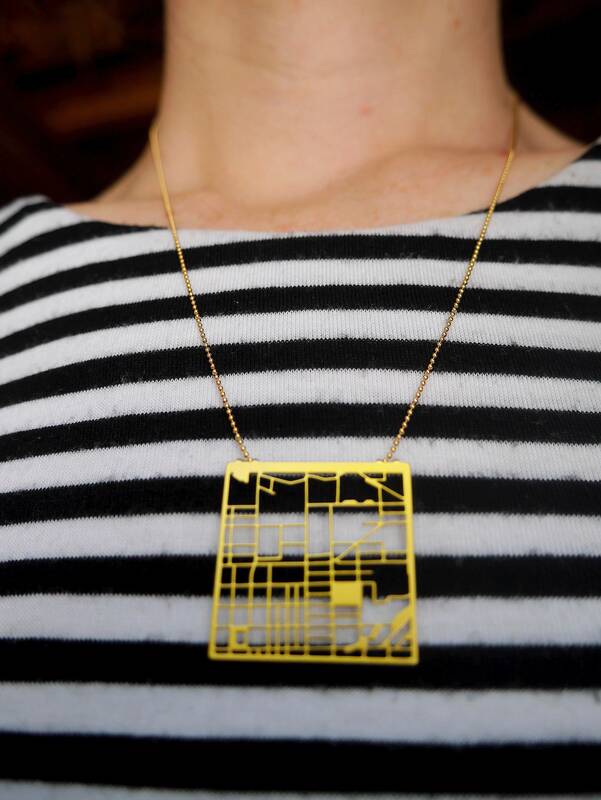 When he bought it I got to choose what part of the world, in map form, my necklace would be. I chose Ellensburg, specifically where Anderson, our dorm room, was and the surrounding campus. I thought it was fitting as this was the place I met Gene, as well as Elisabeth and Sidney. The necklace is beautiful. As someone who does not wear jewelry, I’m very pleased. It looks nice and actually represents something important to me. Win win. After my morning jog with Sidney, I finished a puzzle I had been working on. It was a puzzle of doors and it was fun to do. I wanted to finish before company arrives for the wedding next week as we’ll likely need to use the card table. We went to an ice cream store in the afternoon since it is so hot and I tried chocolate peanut butter ice cream. It was good but really rich so I couldn’t finish it all. A treat for later! That necklace is so cool! And I love the gif!!! yes, cool. do you actually recognize the streets, etc? You could recognize some streets if you looked at google maps, but it might be a bit hard.